A Media Access Control (MAC) address is a 48-bit (6 bytes) address that is used for communication between two hosts in an Ethernet environment. It is a hardware address, which means that it is stored in the firmware of the network card. Every network card manufacturer gets a universally unique 3-byte code called the Organizationally Unique Identifier (OUI). Manufacturers agree to give all NICs a MAC address that begins with the assigned OUI. The manufacturer then assigns a unique value for the last 3 bytes, which ensures that every MAC address is globaly unique. Every hexadecimal character represents 4 bits, so the first six hexadecimal characters represent the vendor (Hewlett Packard in this case). 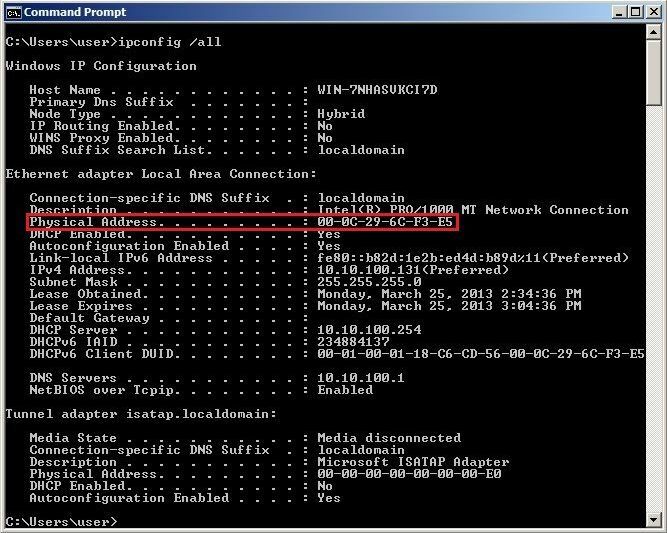 How to find out your own MAC address? If you are using Linux, type the ifconfig command. You should see your MAC address referred to as HWaddress. An IP address is a 32-bit number that identifies a host on a network. Each device that wants to communicate with other devices on a TCP/IP network needs to have an IP address configured. For example, in order to access the Internet, your computer will need to have an IP address assigned (usually obtained by your router from the ISP). An IP address is usually written in the form of four decimal numbers seperated by periods (e.g. 10.0.50.1). In contrast to MAC address, an IP address is a logical address. It can be configured manually or it can be obtained from a DHCP server. The term “IP address” is usually used for IPv4, which is the fourth version of the IP protocol. A newer version exists, IPv6, and uses 128-bit addressing. There are three ranges of addresses that can be used in a private network (e.g. your home LAN). These addresses are not routable through the Internet.